"Пётр и Патрик" : Stop London Zoo 'Lates'! защита природы защита природы - Stop London Zoo 'Lates'! Против эксплуатации животных в зрелищах Великобритании! The London Zoo is raising funds by opening special "zoo lates" events on Friday evenings that involve alcohol, music, singing and crowds of people. There have been reports by keepers of drunken behaviour toward the animals and of people trying to get into animals enclosures, touching penguins, crushing butterflies, throwing glass at animals and pouring beers on people and animals. The London Zoo states there are no animal welfare issues but even if a people's drunken behaviour wasn't compromising animal safety, I think any late night event at the zoo should not be happening and London Zoo should stop exploiting their animals. We all have animals, we are animals, and we all know that we are stressed and our animals are stressed if their routines are disrupted. They are kept awake when they normally sleep, are disturbed by rowdy people, and are scared by unusual noises. If a party is going on next door with loud music and people shouting, drinking, singing and talking loudly, it can cause us as human beings stress, so imagine how it would feel if that party were peering at your family through glass!Of course animals are stressed by these events. The keepers know it -- why doesn't the management put the animals first? I realise London Zoo needs the money, but the animals don't need the stress and the zoo is primarily for the animals welfare not ours! 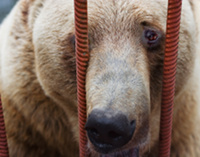 Please sign my petition to ask the London Zoo to stop these events now!